Mr. Eyasu has over fifteen years of experience in Ethiopia working in the area of Research, Anti-Corruption/Transparency Ethics, advocacy, Monitoring & Evaluation, programme management, and Multi-stakeholder facilitation/dialogue. Of the greater number of years, in his career, has been elapsed for the sake of Transparency/Governance and Anti-Corruption Agenda. 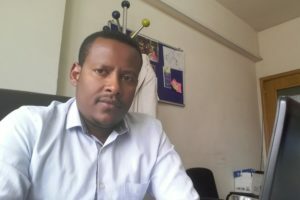 Looking at his current engagement, he is a member of the Board of Transparency Ethiopia (anti-corruption CSO) at the capacity of Vice Chairmanship and a couple of other national initiatives, in the Construction Sector Transparency Ethiopia Initiative (CoST) as Chair and Extractive Industries Transparency Initiative (EITI) as National Steering Committee Member. Due to his involvement in a dozen of national level surveys and data analysis, he has got the skill for proper coordination in the area of data collection, verification, supervision and report write-up. As per his consulting experiences, he has supported CSOs in advising internal governance, transparency and accountability mechanisms. Currently he is managing a joint programme of the UN and Four Developing Regional States in Ethiopia.